This home's gutters were completely clogged by leaves before we installed new black MasterShield leaf guards. We also installed new white seamless gutters on this Seattle home. Unfortunately, before we were called in to inspect the situation, the clogging had caused a significant amount of damage to the home, so our team had to replace 30 feet of the damaged fascia. The seals on these gutters had failed and were gushing water all over the place. This is common in older gutters, but it's even more common if they were never put together right in the first place! To solve this problem we installed new seamless white gutters, as can be seen in the "After" photo, and new black MasterShield gutter covers. Leafless in Seattle installed MasterShield gutter guards in black for this customer to give them worry-free gutter protection. Our team also installed new seamless gutters in white. MasterShield not only provides protection to the gutters but also protects against wood and foundation damage as well. These customers won't have to worry about the inconvenience and expense of gutter maintenance any longer. We'd like an estimate for our home and stand-alone garage. Hello! I have a very low-pitched metal roof. I also live in a wooded area by Carkeek Park (lost of Giant Firs). Although I get my gutters cleaned about every 2 months (sometimes more) I have two that are CONSTANTLY overflowing and clogged. I thought stepping up the cleaning schedule would be enough, but it has not been. I'm interested in an assessment of my gutter system, as well as possible gutter guards for at least the problem areas I can't easily reach to clean. Need to install new gutters around a five sided area and replace one or more other gutters. I have small pine needles that clog my gutter system. We need new gutters for our home. We have a gutter "helmet" type of system on existing and are interested in possibly replacing with your product. Everything was well done and executed. The installation team was awesome! They did great work and took their time doing a quality job. Overall, I am satisfied with the installation. The installation was very consistent. The valley's seem to the weakness in the system. Although,better designed than other outfits, it tends to allow some buildup of debris from where it transitions into the existing valley. I noticed some needles in the valley gutters after a couple of months and I am concerned long term. They seem to work - so far, so few leaves, but of course the big challenge is yet to come. Ask me again at the start of next year if you want the real answer. It would be nice if the work could be scheduled shortly after the initial downpayment and agreement. Gutters work wonderfully. Service was prompt, thorough and exactly as promised. Documentation/ (photos) was provided of the work and roof condition. Offered more roofing services but did not push. Very professional! By DD & Jeff S.
"Gutters work wonderfully. Service was prompt, thorough and..."
"High quality and easy to work with"
We use the highest quality of marine-grade stainless steel to resist corrosion. Our filters are so fine that not even a grain of sand can get through. We shape our product to fit the curve of your roof and work with it. The beautiful, plentiful foliage and wet climate are some reasons many homeowners move to Seattle, but these qualities can wreak havoc on your rain gutters. MasterShield offers an effective solution to the problem, with filters that are small enough to block everything from pine needles to grains of sand. We've also created a sloped guard to allow debris to shed rather than build up on a shelf. This design allows the entire system to be self-cleaning, meaning less maintenance for you. In order to be effective in the rainy Northwest, a gutter guard needs to be able to handle massive amounts of water without diminishing effectiveness. You never know if you'll be dealing with a torrential downpour or rainy days for weeks on end, but a strong system will eliminate your worries and fears. Check out the advantages of MasterShield in Seattle by calling 1-844-834-5382 today or use our online contact form. We'd love the opportunity to show you the difference a truly effective gutter guard can make. We are the exclusive authorized dealer of MasterShield products in the Pacific Northwest. Our team is dedicated to 100 percent customer satisfaction on every job. Money-back guarantee if your rain gutters ever clog. Leafless in Seattle is the Pacific Northwest's only authorized dealer of advanced MasterShield products. This system aggressively protects rain gutters from leaves and other clog-causing debris, so homeowners can always feel completely confident about the function of their home's rain gutters. In fact, we are so certain that GutterSolutions in Seattle will perform correctly that we offer a money-back guarantee if your gutters ever do clog after the system has been installed. We take installation very seriously, because even the best system can fail to meet expectations if it has not been installed correctly. Technicians installing GuttersSolutions on Seattle area homes take the time to make sure everything is done right the first time. We pay attention to every detail so you never have to second guess the security of the rain gutter system protecting your home. Call Leafless in Seattle at 1-844-834-5382 and ask for your free estimate! We look forward to taking great care of you as well as your gutters. 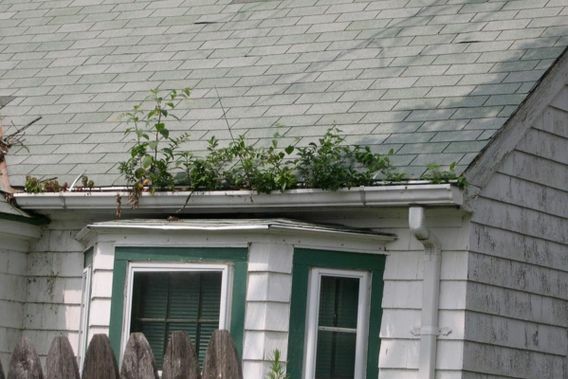 The owners knew the gutters were clogging, but they had no idea how bad the situation really was! As you can see, the gutter isn't plugged - the the leaffilter sure is. No water gets into this system - it just runs over the top. You can see the effect of a clogged cap here, the water and junk just flows over the edge when it rains. This is an example of a flat gutter screen, and why it's a bad attempt at solving clogged gutters because the top just plugs. We removed the old plastic gutters and guards, painted and installed new fascia, then the new leafless gutters with MasterShield. Metal roofing is challenging to work with. It's slippery and, when it rains, water comes flying off it. The only product we've ever seen able to handle the job is MasterShield and when you look at how high this house you can see why she wanted no compromises. High up on a hill overlooking Lake Washington, this homeowner wanted a gutter guard that would clean itself of cedar and fir needles. He changed the roof to metal so that things would slide off better and realized MasterShield's approach of sloping like the roof made a ton of sense. Current open gutters rusting. About 120 linear ft of gutter to replace, with 60 ft. on 2nd floor, 60 ft. on lower levels. Low-slope roof with easy access. Pine tree over garage does fill gutters quickly. Four downspouts. Would like to install rain barrel on one downspout. I would like to get an estimate for Mastershield installation with our current gutter. We have a lot of evergreen trees in our neighborhood and lots of pollen. This year it was almost clay-like. Would like to get your recommendation and cost estimate. I would like to know if you can install gutter guards on our gutters. Looking into replacing the backyard-facing gutters. I believe there are about 30 to 40 feet of gutters on the backyard-facing roof, really to get the house ready for the market. Thanks. My gutters are getting very old and the paint is peeling off them. Not all the gutters on the front and the back side of the house match and some of them aren't secured properly. Looking for an estimate on what it would cost to replace them.